As chief bridesmaid it was my job to find the perfect location for Hens Night 2.0 for last weekends celebrations and I narrowed it down to party-friendly West End. However not being a seasoned party girl I had to call on a friend for some help to find the perfect place to take our bride… and find it we did at Jungle Tiki Bar. When narrowing down the search my only requirement was that we went somewhere that we could hear ourselves speak. I've never understood the attraction to places where you have to scream yourself hoarse just to be heard by friends standing 2 inches away. Luckily my buddy knew about Jungle Bar and she marched us there in perfect-heeled unison. Jungle Bar is a cutesy little place hidden off the main drag at 72 Vulture Street. There are about 8 tables which means service is quick and very welcoming. Around each of the tables are stunning and individually carved tiki stools. 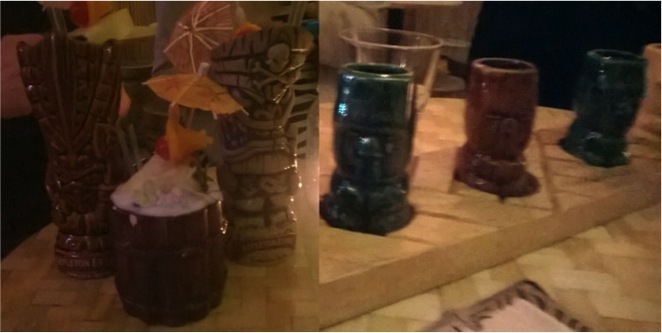 The bartender told us how each were crafted in Bali and were shipped over to Brisbane especially for the interesting bar. Each one is strikingly different and weighs various amounts. It took a lot of convincing to stop the bride from taking one home as an early wedding present. The intricate handiwork covering the gorgeous stools blew her away. After pointing out that my bestie was donning the white veil the very friendly barman bought out a line of tiki shot glasses filled with a variety of different rums. We sniffed each one, taking in the diverse cinnamon and citrus fruit aromas only to argue over which one we wanted to toast with. The yummy flavors made for an easy to drink (or shot) beverage. Be aware though, I couldn't see this fun addition anywhere on the menu, so you might just have to ask. A testament to how cool the drinks on offer are, is the high rates of theft. 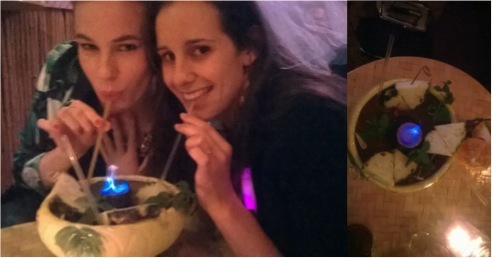 The bride was desperate for a Monkey cocktail in an amazing monkey shaped cup. However the poor bartender had to inform us that as of two weeks ago they had all been stolen. However undeterred by the stolen monkey glass dilemma I ordered a $20 Zombie cocktail that was worth every cent. The gorgeous fruity flavors mixed with 6 types of rum warmed me right up on our cold and windy night out. A delicious combination! Next up we ordered the Hurricane. This bad boy is meant to be shared! If you plan to tackle one on your own make sure you space it out over 5-6 hours because it is one wicked little drink. It comes to the table in a fish bowl shaped container filled with a multitude of delicious and complimentary flavors. What makes this drink extra special is that in the center is a little volcano of rum that is set alight. After you have finished slurping up the drink you can blow out the flames and take the shot. But as the bride soon found out, alcohol is meant to be drunk cold, so maybe give it some time to cool down. The yummy drinks, delightful service and gorgeous Bali inspired décor made for a wonderful night. 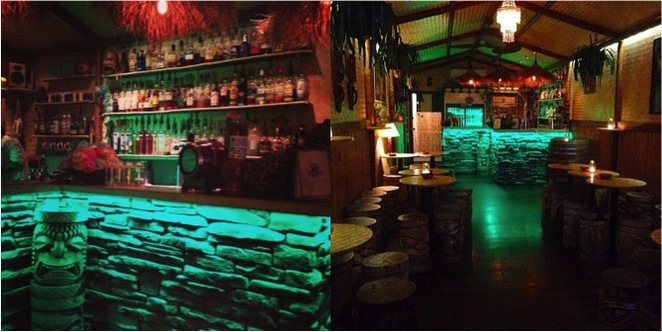 Next time you are in West End venture away from the noisy main road and take in a cocktail at Jungle Tiki Bar. Why? To try an interesting drink. When: Whenever you have a spare night.